New Delhi: After months of 'will it? will it not? ', the Bharatiya Janata Party (BJP) has declared that - by political implication - Narendra Modi still remains its best bet in the Indian electoral arena. Like the knight in shining armour, he is expected - yet again - to rescue the BJP from the demons which now and then crop up in the form of assembly elections in different states with varying degrees of significance in the larger Indian political system. The BJP in-charge for Bihar, union cabinet minister Ananth Kumar, said on June 16 that although the BJP had several capable leaders in the state, it would fight the upcoming battle in the name of Modi. BJP's upper caste leaders like C.P. Thakur, Ravi Shankar Prasad, Rajeev Pratap Rudy and Radha Mohan Singh are the prominent faces in the race for the top post. BJP's backward caste leaders include Sushil Kumar Modi, Prem Kumar and Nand Kishore Yadav. By not naming any chief ministerial candidate, the party seems to have ensured that the internecine war the move could have triggered would be prevented. But what is the guarantee that these leaders won't play dirty tricks to ensure the defeat of supporters of rival aspirants to the chief minister's post so as to brighten their own prospects? A BJP leader admitted to the deep divide in the Bihar unit. "The BJP in Bihar is a divided house. To project a leader from either the OBCs or upper castes as chief minister candidate will antagonise the other group. We are not in a position to project anyone against Nitish Kumar," a senior BJP leader who did not want to be named told IANS. On the other hand, the Janata Parivar has projected Nitish Kumar as its chief ministerial hopeful, sending out a strong message that whatever the political compulsions of the likes of Lalu Prasad, they would like to see Nitish Kumar as chief minister for a third term. All constituents of the Nitish-led combine will transfer votes to one account, which can't be said for the BJP-led army. Clearly, the BJP has conceded Round One to Nitish. 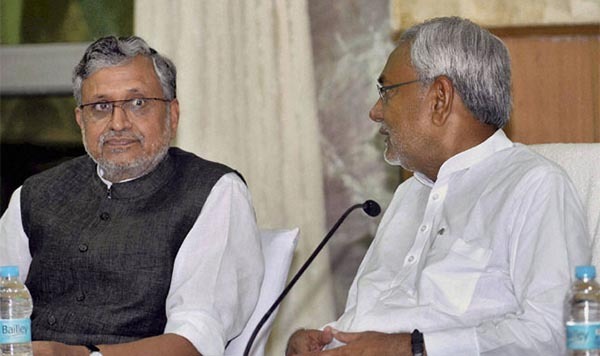 In the Bihar assembly election of 2010, the JD-U led by Nitish Kumar won 112 seats with 22.61 percent votes while then ally Sushil Kumar Modi steered the BJP to victory in 94 seats (16.46 percent). Lalu Prasad's RJD won 22 seats (18.84 percent), the Congress four (8.38 percent) and Ram Vilas Paswan's three seats (6.75 percent). Much water has flown down the Ganges since Narendra Modi strode to power at the centre on the wings of the promise of 'achche din aane wale hain'. It is no secret that Modi has lost at least some of the aura the media blitz in the run-up to the general election he and his team built. Although the BJP kept its winning streak after the Lok Sabha election in states like Maharashtra, Jharkhand and Haryana and put up an impressive show in Jammu and Kashmir, its juggernaut halted in Delhi. The February 2015 election in Delhi proved to be a political temblor in the heart of Indian democracy. The Aam Aadmi Party hurricane notched 67 of the 70 seats, puncturing the BJP and leaving it with just three seats. It was the first ever electoral setback for Narendra Modi since he came to rule Gujarat in 2001. It was the Delhi disaster that forced BJP leaders to think if projecting Modi and party president Amit Shah in Bihar would be a wise political decision. However, caste arithmetic and feuding Bihar leaders have again forced the BJP's hand. Will the gamble pay off?